LEFT This tool shed is anything but shed-like. Two sides of the building open in a manner similar to a garage door in order to allow the large farming equipment to pass through. The openings are designed much the same as overhead aircraft hangar doors — without center column supports. The door on the narrow end is 60' wide and the side door is 70' wide. walk-behind unit with semi-angular No. 280 mesh steel shot media. To remove the concrete from areas located within five inches from the walls, as well as under stairs and in tight areas, they used Metabo seven-inch handheld diamond grind- ers. Any dust not contained by attached vacuum systems was vacuumed up using DW pulse vacuums. After eight long hours, the two-man team called it a busy and successful day of cleaning over 8,500 square feet of concrete. (EPC), CrownShield 50, Product No. 320. Regardless of whether they were narrow- or wide-void, none of the cracks were deeply excavated for fear of damaging the heating system elements. The second day, BodyTek's five- man crew arrived and two men were assigned the crack and joint work. They began by chasing and opening the multi- tude of cracks in excess of 400 linear feet in the concrete floor. Donning the same personal protective equipment (PPE) as the previous day's crew, the crew used a 16-inch Joe Due crack chasing blade attached to a DeWalt angle grinder to clean and open the cracks and the single expansion joint. The narrow void cracks then were filled with a flexible load-bearing epoxy joint sealer product, CrownFlex Joint Sealer, Product No. 505. It was poured into the cracks and hand- troweled to create a smooth transition to both sides of the concrete surfaces. 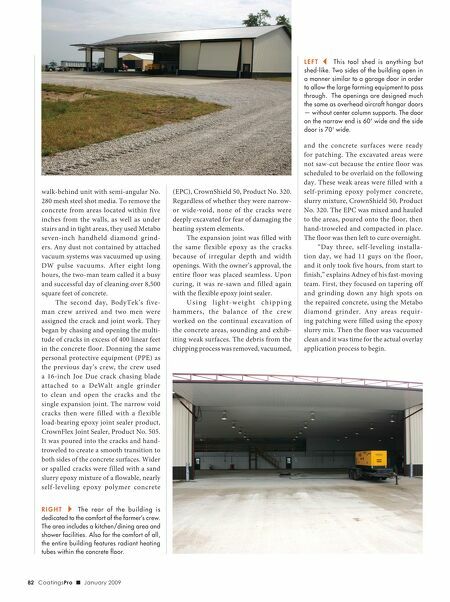 Wider or spalled cracks were filled with a sand slurry epoxy mixture of a flowable, nearly self-leveling epoxy polymer concrete RIGHT The rear of the building is dedicated to the comfort of the farmer's crew. The area includes a kitchen/dining area and shower facilities. Also for the comfort of all, the entire building features radiant heating tubes within the concrete floor. 82 CoatingsPro J January 2009 The expansion joint was filled with the same flexible epoxy as the cracks because of irregular depth and width openings. With the owner's approval, the entire floor was placed seamless. Upon curing, it was re-sawn and filled again with the flexible epoxy joint sealer. Using light-weight chipping hammers, the balance of the crew worked on the continual excavation of the concrete areas, sounding and exhib- iting weak surfaces. The debris from the chipping process was removed, vacuumed, and the concrete surfaces were ready for patching. The excavated areas were not saw-cut because the entire floor was scheduled to be overlaid on the following day. These weak areas were filled with a self-priming epoxy polymer concrete, slurry mixture, CrownShield 50, Product No. 320. The EPC was mixed and hauled to the areas, poured onto the floor, then hand-troweled and compacted in place. The floor was then left to cure overnight. "Day three, self-leveling installa- tion day, we had 11 guys on the floor, and it only took five hours, from start to finish," explains Adney of his fast-moving team. First, they focused on tapering off and grinding down any high spots on the repaired concrete, using the Metabo diamond grinder. 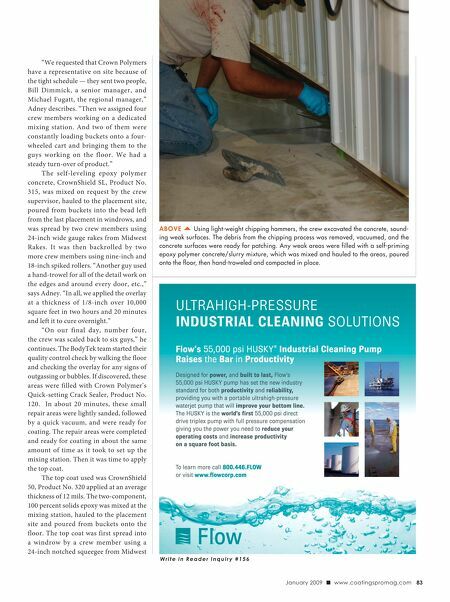 Any areas requir- ing patching were filled using the epoxy slurry mix. Then the floor was vacuumed clean and it was time for the actual overlay application process to begin.